At present billion of users, uses latest technology Android Smartphones. These Android phone lovers use different apps in the Smartphones. 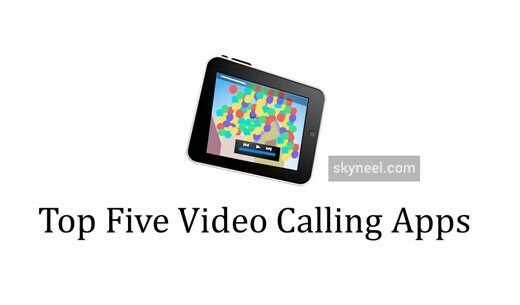 In this post today as we discuss about top five free video calling apps for Android Smartphones. Google play provides most popular apps which provide the facility of video calling for Android smartphone users. Video calling trend is widely used for when you get a front camera facility in your smartphone. Lot of Android lovers like video calling or video chat facility to talk to other users.There are few important Android Smartphone Free Top-Five Video Calling Apps which helps you to easily make video calling without any extra effort. You can easily download this app from Google Play. The main facility of this app is you can easily do free all messages, local, global and video calls. You can use high quality video calling, One to one group chat, add up to 300 friends in your friend list, support of 3G / 4G and Wi-Fi facility, easily upload photos and videos on social networking sites, play free online games, watch stories in different sections of entertainment, sports, music and lifestyle and also have facility to like, share and also insert any comment on the published photos. Before download this app, please check your smartphone specification. At present 1 billion android users have already download this app in his Android smartphone. As per the user rating of Google play of this app have 4.3 stars from 5. You can easily download this app from the Google play store click here. It is the best and very popular video calling app which is easily downloaded on Android Smartphones. This app was following given important features like: Instant messaging, free voice calls and minimum charges for international calls, video calling, and easy calling facility on any type land-line, mobile or in any network, easily use both front and rear camera, chat with friends with the help of windows live messenger facility. This app is already downloaded up to 10 billion Android lovers in the Smartphones via Google play store. This app has different specification on different Android Smartphones. As per the user rating of Google play of this app have 4.1 stars from 5. You can easily download this app from the Google play store click here. This is also a free video calling app which is easily downloaded from the Google play. This app was following given few important features: provide group chatting facilities, free voice calls with video recording facility, instant messaging, easily maintain connection between different platforms means Android to windows/ iOS/ blackberry, high resolution video calling facility, easily check your personal history. If you want to download this app on your android phone, then you have at least 2.3 or upper version of the operating system. This app is already downloaded by one billion users. As per the user rating of Google play of this app have 4.3 stars from 5. You can easily download this app from the Google play store click here. This is another very popular app which is used for video calling, group calls and group text. This app is easily downloaded from the Google play store. This app has a few important features, which is given below: With the help of this app you can easily start a video call from Android to any other operating system. You can easily connect up to 4 friends at the same time on group calling facility. You get national and international level free messages, free calls and video facility. Easy call from mobile to landline, minimum charges for premium calls and if you want to active registration, then you can use the phone number at the place of user name and password. You can easily download this app from the Google play store. If you want to download this app, then you have at least Android version 2.2 or above operating system. As per the user rating of Google play of this app have 3.9 stars from 5. This app is already downloaded by 1 billion users on his Smartphones. This app provides the facility to talk with Facebook friends by video calls with the help of 3G or wi-fi connection. This app has a few important features which are given below: You can use HD video and audio call facility, start a video call with your worldwide Facebook friends, and provide a facility to customize privacy settings, Mobile operator data charges. You can easily download this app from the Google play store. I hope you like these Video Calling Apps. Give your important suggestion in the comment box and also share this article with your friends, colleague, staff members and other android smartphone lovers. Thanks.